International industrial firm Boccard opened its new nuclear centre of excellence in Bristol yesterday (11 February, 2019). 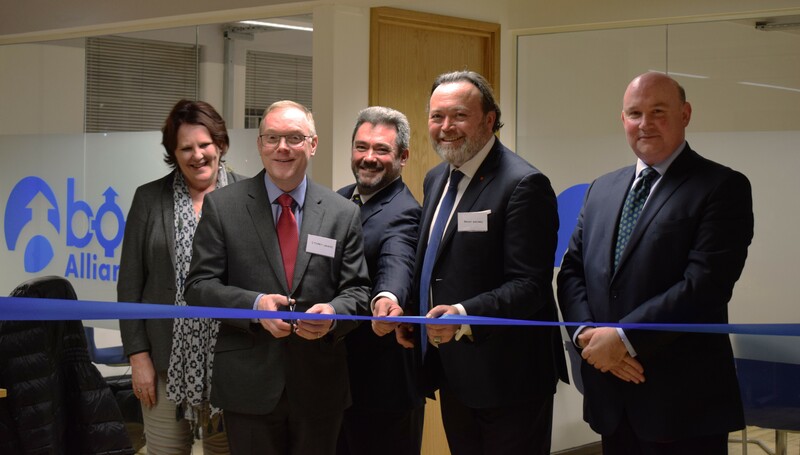 Chief executive, Bruno Boccard, journeyed from France to officially open the new office, within Bristol Temple Quarter, alongside Stuart Crooks, EDF Managing Director of Hinkley Point C, in the presence of West of England Mayor Tim Bowles. Around 30 highly skilled new jobs will be created at the new office, which will be the company’s centre of nuclear excellence in the UK, in support of the Hinkley Point C Nuclear New Build team which will employ around 200 people. Boccard was established in France in 1918 by Joseph Boccard, and the company has just celebrated its first 100 years. It remains a family-owned business with Bruno and Patrick Boccard now leading the company into its second century. The opening of the Bristol office is a continuation of Boccard’s investment into the UK which now promotes and aids future growth opportunities. Douglas McQueen, Managing Director of Boccard UK, said: “The new office is ideally situated next to some of our key customers, EDF Energy on the Nuclear New Build at Hinkley Point C, in Somerset, as well as other prime contractors and partners involved in the project. We are looking to establish a strong relationship with the National College for Nuclear Southern Hub to provide training and job opportunities within the region as well as sharing our own experience and expertise from working on the EPR reactor at Flamanville. Tim Bowles, Mayor of the West of England, said: “We’re delighted to welcome Boccard UK to the West of England, creating even more opportunities for our highly-skilled residents and increasing our supply chain activity – both nationally and globally. Boccard UK Ltd was formed in 2007 following the acquisition of Shell lubricants fluid management company and established its first UK office based in Greater Manchester. Since that time the company has continued to invest in the UK and expanded its operations into the engineering, manufacturing, construction and industrial maintenance sectors. Boccard operates out of 35 countries, employing 3,500 experts worldwide. Photo of the official opening: (left to right) Corinne Matthews, New Nuclear Co-ordinator, Heart of the South West LEP; Stuart Crooks, Managing Director of Hinkley Point C; Douglas McQueen, of Boccard UK; Bruno Boccard, Chief Executive of Boccard; and West of England Mayor, Tim Bowles.